Rooibos, meaning "red bush," is a South African plant of the Legume family (Fabaceae, aka Leguminosae), with bright green, needle-like leaves that turn red upon processing. The shrub, Aspalathus linearis, has a very limited growing area, only in the Cedarberg Mountains of the Western Cape of South Africa, mainly at three small rural communities: Wupperthal, Eselbank, and Heuningvlei (see Figure 1). The mountain-dwelling people of the Khoi tribe (sometimes called "bushmen") who live in that area were the first to develop a method for making tea from rooibos, a practice traced back at least 300 years. This tea was also appreciated by the European settlers. Though the process of making the tea leaves ready for brewing has become more automated in recent years, the steps remain the same: the leaves (and sometimes twigs) are picked, bruised, fermented ("sweated"), then sun-dried. It is the bruising step, in which the leaves are hammered or crushed, that allows the material to develop its distinctive red color during the sweating process. The tea, cherished for its deep aroma, full-bodied taste, and health benefits, is the most popular drink in South Africa. It is enjoyed hot or iced, plain or sweetened, with milk or without. Three flavonoids-quercetin, luteolin, and aspalathin-give rooibos antioxidant properties, which provide the main health benefits attributed to regular consumption of the tea. Antioxidants are understood to reduce some of the effects of aging, preventing damage to the circulatory system by lipid peroxidation; they also help block carcinogenesis. In addition, these flavonoids have allergy-inhibiting activities, with effects notable at relatively high dosage levels (e.g., regular consumption of the tea). Quercetin and luteolin are found in many herbs, though usually in smaller amounts; aspalathin is unique to rooibos. 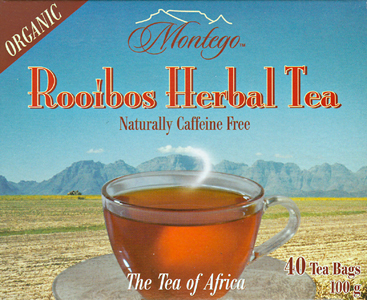 Celestial Seasonings Tea Company, during its formative years, had introduced rooibos to North America as one of its important herbs for making good tasting and healthy herbal blends, but then withdrew it due to the U.S. embargo of goods from South Africa. During the 1990s, the tea was once again imported; Celestial Seasonings and others, such as Good Earth Teas (for which rooibos is the central herb of their standard blend) and Montego in Canada, have restored it to a prominent position. The South African export control board reported 4,500 metric tons of rooibos exported in 2000, more than twice the amount for 1999. Major destinations include Europe (Germany, Netherlands, and United Kingdom), Asia (Japan, South Korea, China, and Malaysia), and North America (U.S. and Canada). Rooibos continues to be used extensively in South Africa, at a rate of 3,600 tons per year for the domestic market. Rooibos appears headed to becoming the second most commonly consumed beverage tea ingredient in the world after ordinary tea (Camellia sinensis). Since the herb contains no caffeine, it is often selected when there is a concern about stimulant properties of tea. In fact, it is used as a bed-time tea to help alleviate insomnia. The plant is now cultivated in order to meet the large demands. To help assure adequate supplies of rooibos and other natural products in the area, a collaborative project between the Agricultural Research Council of South Africa, the US Herb Research Foundation, and Purdue University, was established under the name A-SNAPP (Agribusiness in Sustainable Natural African Plant Products). A-SNAPP is helping South African small farmers make the transition from wild harvesting to sustainable cultivation, using organic cultivation methods. More than 75 farmers currently participate in the program, many of whom used to gather rooibos in the wild. 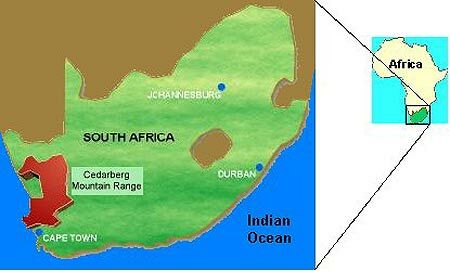 Figure 1: Growing location of Aspalathus linearis-rooibos, in the Cedarberg Mountains. Figure 3: Rooibos leaf harvest.